Autumn is practically here. The chill is supposed to set in slightly this week in Chicagoland and the temperature has turned noticeably cooler in the evenings. I am hoping to get one more batch of pesto out of my basil before it turns completely brown. 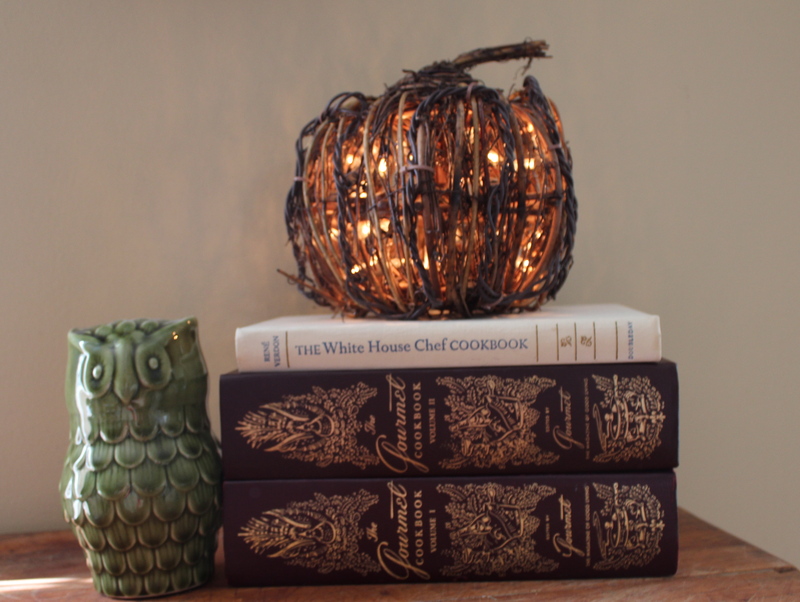 Inspiration struck over the weekend to take out some of my fall decorations when I saw that a friend had put hers out. Thank you for the motivation, Debbie. 😉 Except this year, I wanted to show some more restraint. 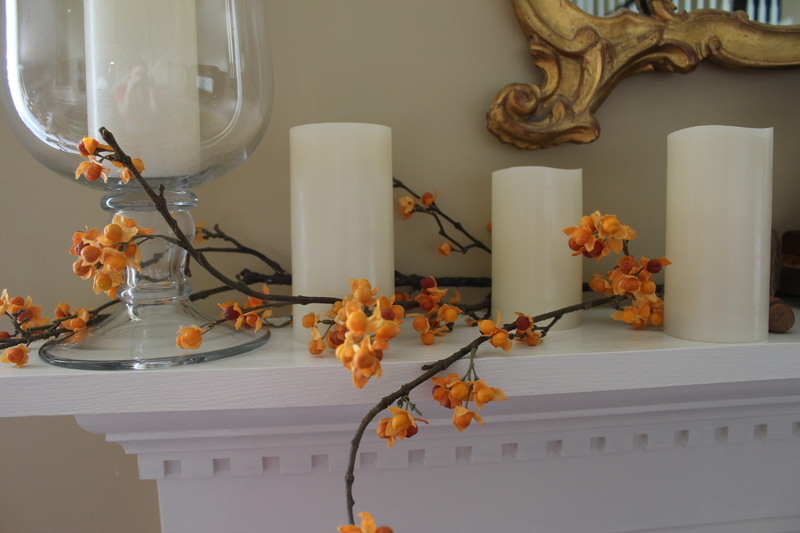 In the past, I have admittedly gotten carried away with my fall decorating. It looked like a Halloween store/leaf storm blew through the house. Part of it is for the kids and the outdoor decorations will still be out in full force, but some rooms I plan to keep Halloween-free because, let’s face it, it’s not relaxing decor, is it? A skull blinking on and off or a witch staring at you while you eat dinner. It can be a little unsettling for guests. I saw a butcher block decorated for fall on Pinterest and decided to recreate the look. The only thing I am missing is a basket below and a copper bowl or pitcher with some gourds. Here is our mantle. I am not entirely happy with the duck decoy in the middle, but I will keep playing around with it. A close-up of the bittersweet I bought from Pottery Barn many moons ago. I love bittersweet. 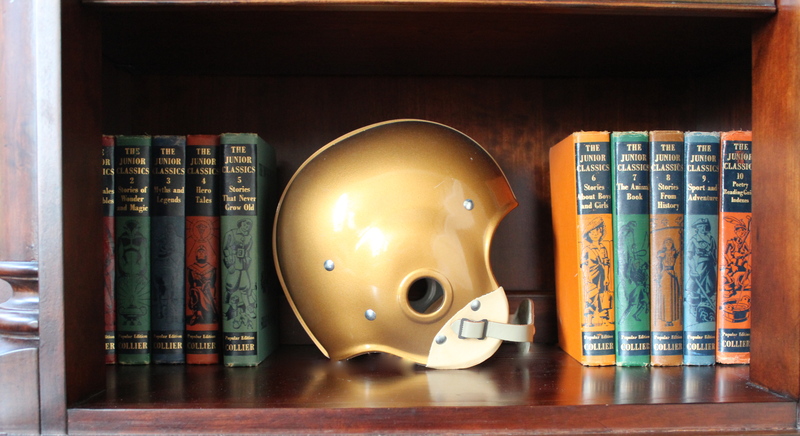 A few children’s classics that belonged to my dad when he was growing up and an NFL Throwback helmet. Voila. Subtle fall touches. What do you like to put out when the seasons change? Get the house cozy now because it sounds like this winter is going to be a doozy!